Tulsa overcomes a three-goal third period deficit thanks to a hat-trick from Ryan Tesink, but Kansas City scores late to snap Oilers winning streak. 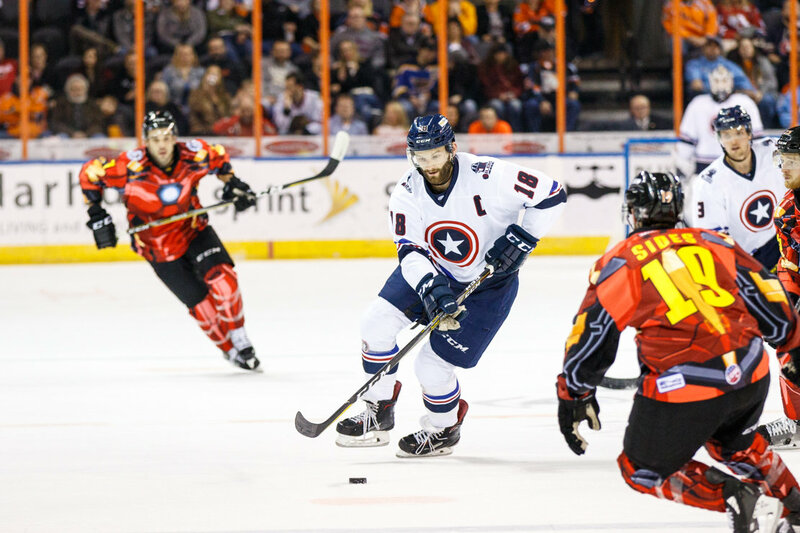 INDEPENDENCE, MO – A hat-trick from Ryan Tesink brought the Tulsa Oilers (13-3-4) back from a three-goal third period deficit to tie the game Saturday, but a late goal from Darian Dziurzynski help the Kansas City Mavericks (12-5-1) finish off a 6-4 win at Silverstein Eye Centers Arena. The loss snapped Tulsa’s season-long six-game winning streak. Kansas City scored three times in the opening period to lead 3-0 after 20 minutes. Jordan Ernst tallied the Teddy Bear Toss goal for the Mavericks with a shot from the corner that fooled Tulsa goaltender Evan Fitzpatrick. Former Oilers forward Joey Sides made it 2-0 when he stuffed home a loose puck at the edge of the crease. Jared VanWormer buried a rebound late in the frame for the third Kansas City goal. The Oilers outshot the Mavericks 15-6 in the middle period, and Tesink put Tulsa on the board with a quick wrist shot under the glove of Kansas City goaltender Mason McDonald. The Mavericks had an answer, though, as Rocco Carzo tapped in a centering pass from the edge of the crease with two seconds left in a Kansas City power play to make it 4-1 after 40 minutes. Tesink started the Oilers dramatic comeback with his second of the game early in the third period, and Dylan Bredo fired a shot from high in the slot that beat McDonald to make it 4-3. Tesink then completed his hat-trick with 4:59 to play to even the score at 4-4 in a game that suddenly looked destined for overtime. The Mavericks, however, forced a Tulsa turnover late and Dziurzynski capitalized with 2:15 to play to put Kansas City in front for good. VanWormer added an empty net goal in the final 20 seconds. The Oilers return home for a Tuesday night tilt on the York Plumbing Ice at the BOK at 7:05pm against the Wichita Thunder in the fifth meeting of the season in the StoneWolf Casino Cup rivalry. Tulsa then takes to the road for its longest road trip of the season starting Friday in Toledo.